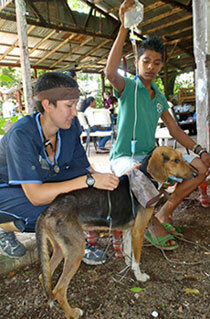 CVM student Christina Lackey treats a pet at the free clinic in Ometepe Nicaragua. Ometepe Island is a tropical jewel in the middle of Lake Nicaragua with miles of sandy beaches and stunning scenery but it is largely undeveloped. Reached only by ferry over notoriously rough water, the villages of Ometepe have few modern amenities and, despite an economy based largely on livestock and agriculture, Ometepe has no resident veterinarian. Once a year, the OSU student chapter of the International Veterinary Students Association (IVSA) organizes a trip to Ometepe to provide a week of free clinics. This September, thirty students and eight faculty from the OSU College of Veterinary Medicine (CVM) plus four Oregon veterinarians, volunteered their time to treat more than 400 sick animals. In addition, they performed 78 spay and neuters, eleven equine castrations, and 24 equine dental procedures. Each morning volunteers walked down a dirt road from their hotel to a makeshift clinic and found a line of people waiting with their animals. “Some of these people would wait all day just so we could examine their pet,” says CVM student, Sara Livesay. “There were a few very long days where we ended up doing surgery with headlamps for light, and after the procedure the owner was still there waiting for their dog to recover so they could take them home.” And when they weren’t working at the clinic, team members made dozens of farm calls often travelling by mountain bike to rural areas. The mission of the IVSA trip is to provide optimal care to the animals, education to the people of Ometepe, and maximum learning experiences for the student volunteers. This was CVM’s seventh visit to Nicaragua and students who made the trip last year had the satisfaction of seeing 120 returning patients. In addition to veterinary care, the OSU team offered a public health seminar on infectious and zoonotic diseases. Companion animals suffer from malnourishment and diseases, many of which are transmissible to their human families. By addressing these issues, IVSA hopes to improve the health of both pets and people while also reducing disease transmission by encouraging appropriate sanitation and health practices. This year’s presentation also incorporated flea and tick control education. The seminar was well received, and all attendees received flea and tick preventative for their pets as a bonus. Another educational component of this year’s trip was provided by CVM Department Head, Dr. Luiz Bermudez, who supported five students in research projects related to the challenges faced by the animals of Nicaragua. Ryan Hill (Class of 2013), researched the prevalence of leptospirosis in dogs. Kelby Myers (Class of 2013) and Sara Livesay (Class of 2013) researched the intestinal parasites of horses and pigs, respectively, while Stacee Hironaga-Kim (Class of 2013) and Laura Niman (Class of 2014) will be compiling data on the anesthesia protocols and outcomes used by the group. Also on the trip were faculty member Dr. Hernán Montilla; OSU CVM anesthesiology resident Dr. Ana del Alamo; Dr. Steve Sundholm of Oregon City, Dr. Vicky Addie of British Columbia, Canada; Dr. Melissa Adamson of Fort Lauderdale, Florida; Dr. Alison Lord of Portland; Dr. Donna Anderson of Portland; and Dr. Martin Warbington of Bend. This important educational and service trip would not have been possible without generous donations from the community and veterinary clinics across Oregon. Special thanks to IDEXX, Bayer, Banfield, Summit, CP Medical, Farnam, Bimeda, Oxbow, Honest Kitchen, Powerfloat Inc., Novartis, Purina and everyone else that contributed time, energy, monetary donations or supplies to the cause. 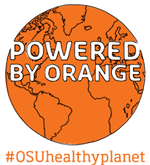 NOTE: The OSU Chapter of the International Veterinary Students’ Association would like to extend their welcome to the Class of 2015! Are you interested in international service and making a difference in the lives of others all while learning about veterinary medicine and other cultures? IVSA’s ambition is to do just that. In addition to the Ometepe service trip, IVSA holds provides other opportunities throughout the year for students to learn about international veterinary issues and service opportunities. Last spring the club held its first “One Health One World” service symposium, which focused on the connections between human and animal health. The symposium was held in conjunction with their annual fundraiser, the International Food Fest. IVSA also hosts many interesting speakers, holds the famous annual silent auction, provides scholarships for international veterinary work, and hosts OHOW week. To learn more about the IVSA, contact Ali McKay: ali.catz2013@gmail.com.